Fighting fraud is a crucial part of the Government’s work. When successful, fraudsters’ crimes have a devastating impact on individuals’ lives. We know many people depend on public services, and that is why it is important we do all we can to stop money being diverted away from the public purse. This week, delegations from the International Public Sector Fraud Forum (IPSFF) are meeting in London. It is truly impressive to see how much has been achieved by a Forum set up only a year ago. Looking back to when I spoke at the Forum last year, I am extremely proud of the progress that has taken place in such a short space of time. Critically, the Forum has helped build strong bilateral relationships between all its partners and the sharing of best practice on its overarching work. The Forum now acts as a valuable support network, where members can talk and learn from one another. As a group, the IPSFF has come together as a single force. I am particularly pleased to see their publication, today, of A Guide to Managing Fraud for Public Bodies. 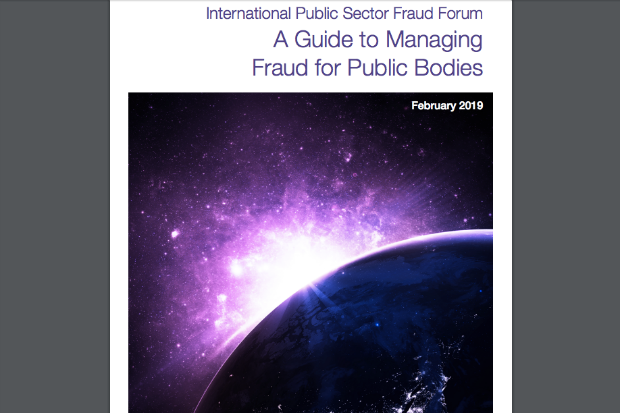 This guide pools expertise from five partner countries and contains a set of principles that public bodies should embrace in order to have effective counter fraud response. It also includes a guide of ‘40 red flags’ that should be considered in counter fraud policy programme development. Over the last year, the Centre of Expertise for Counter Fraud has been working closely with its Australian partners, talking about identifying and dealing with their own specific fraud challenges. These discussions have led to the Australian Government considering setting up its own central counter fraud team, similar to our UK team. Our achievements show we are innovating and going further and driving our work not only in the UK but with our international partners through the IPSFF. However, we are not finished. Fraud is a constantly evolving crime that finds new ways to threaten the public sector and our economy as a whole. It is our responsibility to make sure we have the appropriate counter fraud measures in place. This means the capability we put in place to fight fraud must also constantly evolve. We have strengthened our counter fraud response because we have acknowledged that fraud is an unwelcome reality in any organisation, and denying its existence does not make it go away. To fight fraud, you have to grow a culture that encourages openness about fraud, from the bottom right to the top. Success in fighting fraud comes from finding it first. That is why, in the 2018 Annual Fraud Landscape Report, we were pleased to report a rise in detected fraud in central government. By finding more fraud we are helping to reduce its impact. This shows why the initiatives delivered by the Centre of Expertise for Counter Fraud, working from the Cabinet Office, have been so critical. It has been an eventful year, where we have seen the launch of the new Government Counter Fraud Profession; the roll-out of new Government Counter Fraud Functional Standards against which public bodies will work to; a record £300 million saved by the National Fraud Initiative; and an increase in the use of data sharing and analytics across the public sector. Our achievements have not come overnight but rather are the results of several years of hard work to change the way we think about and manage fraud in the UK. The work the counter fraud community has delivered tells fraudsters that the public sector fraud landscape is changing. Increasingly, we are one counter fraud community that is sharing its counter fraud skills, knowledge and experiences across government departments to take on this hidden crime. This can only be good for citizens, and bad for fraudsters. And the work we’re leading with our international partners will only make this community stronger, pushing boundaries further and making this community stronger.